When, during his exhausting journey home from Troy, Odysseus wished to gain access to the Underworld, he had to travel far to the west on the shores of Ocean and dig a pit. Into this, he was told to pour libations of milk, honey, wine, water, and barley meal. And as if all of that wasn’t enough, he then had to sacrifice a ram and a ewe. Happily, you don’t have to go to such lengths to experience Hades these days (and, rest assured, no animals will be harmed in what follows). 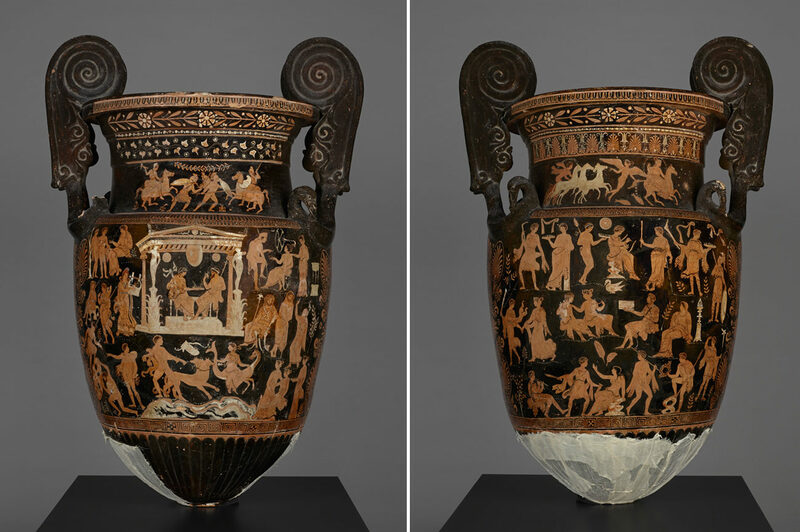 For this monumental Apulian volute (handled) krater, which bears a detailed depiction of the Underworld, has recently arrived in the conservation studios of the Getty Villa. The vase is on loan from the Museo Archeologico Nazionale di Napoli, and is the latest in a series of fruitful conservation projects that we’ve undertaken with our colleagues in Naples. 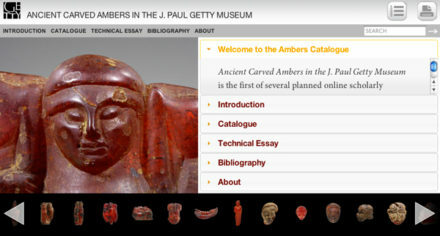 Regular Getty-watchers will remember the statue of Apollo from Pompeii, or the monumental Tiberius from Herculaneum. Both of those projects resulted in exhibitions, and we intend to put the vase on view once the conservation work has been completed. The krater was discovered by 1848 in the area of Altamura, in southeast Italy. Rich burials in the region almost always included a large volute krater (you may recall the trio presented in our Dangerous Perfection exhibition), but this is a particularly grand example, measuring 1.60 meters in height. It was found in fragments, so even as we begin our studies, we know that it was heavily restored in the nineteenth century. We’ll learn just how extensively as our work proceeds, and in the coming months we will keep you updated with further blog posts and videos. To begin, though, here’s a quick guide to who’s who in the Underworld as depicted on the vase. Front and center, we have the king and queen, Hades and Persephone. 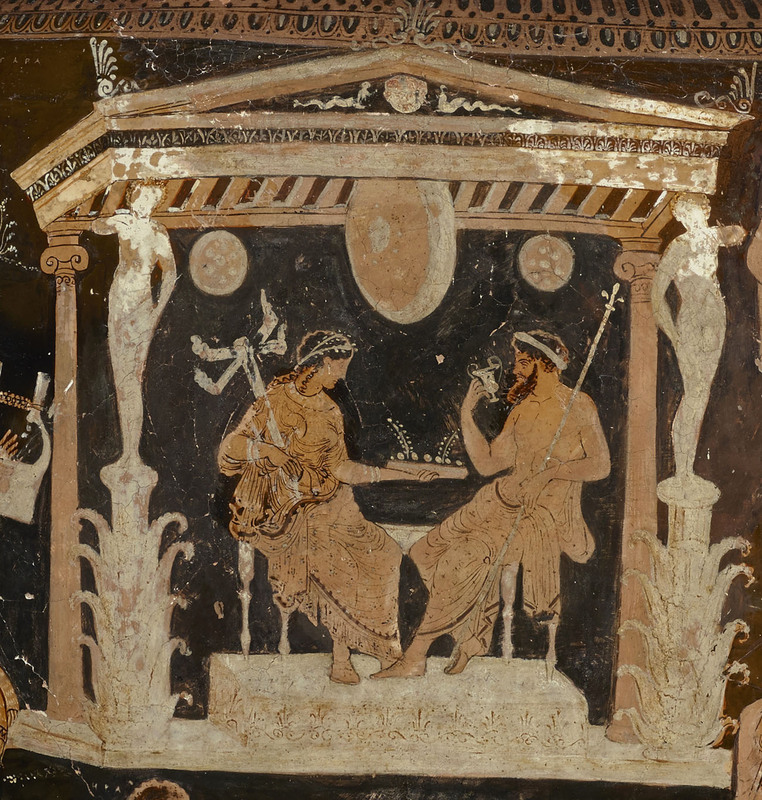 Also known as Plouton and Kore (the name “Hades” can be used for both the god and the place), they enjoy food and drink together as they sit in an imposing temple-like structure, with elegant figures serving as columnar supports. Hades seized Persephone to be his bride and brought her down to rule with him in the Underworld. 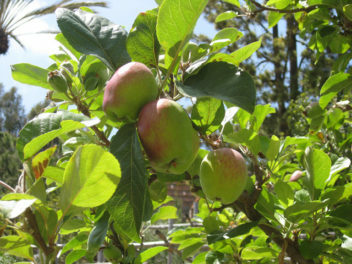 Demeter, Persephone’s mother, was understandably distraught, and spent months searching for her daughter. Though she found her in the end, crafty Hades ensured that Persephone had taken a bite from a pomegranate whilst she had been amongst the dead. This meant that she would always have to spend a third of the year down below. The story of a young girl disappearing underground and emerging each year is reminiscent of plants that wither and die only to re-emerge in the spring, and is deeply connected with ancient Greek beliefs about the seasons, fertility, birth, death, and marriage—all of which will warrant another blog post. Hades and Persephone were the principal rulers in the Underworld, but there were other figures who served as arbitrators of disputes among the dead. They appear on this vase on the right of the palace, and inscriptions give their names. 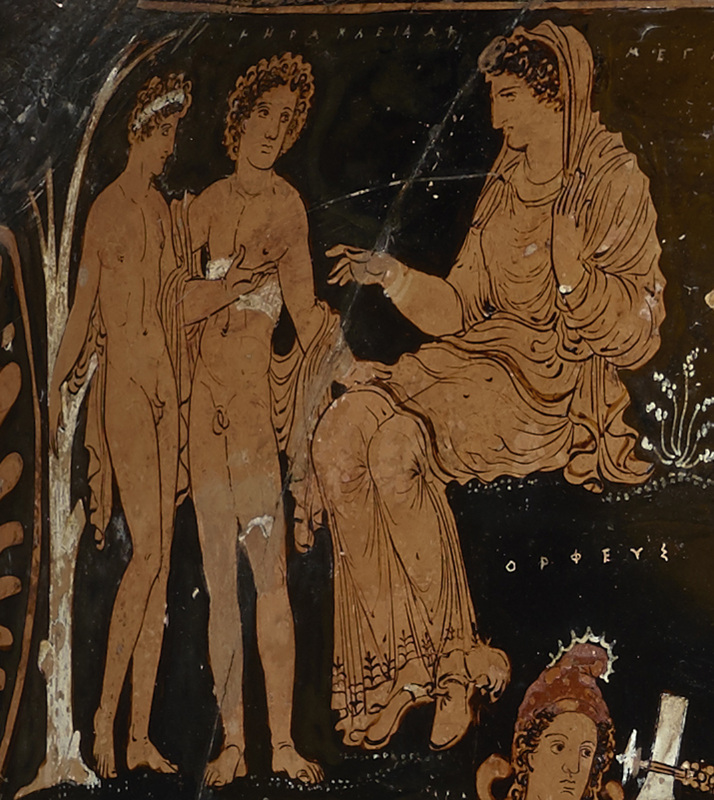 Triptolemos, in elaborate drapery, is seated with an eagle-topped staff, while Aiakos stands beside him. They both listen as a third judge, Rhadymanthos, gestures imperiously. Meanwhile, serenading the rulers outside of their palace is Orpheus. Named by an inscription, he is readily recognizable by his lyre, rich costume, and distinctive headgear. Famously, his music could charm all who heard it, and he used this skill to good effect after his wife Eurydice died. Heading down into the Underworld, he persuaded the gods to release her. Sadly, he neglected their instruction not to look back as they returned to the upper world—and so lost his wife for a second time. Still, the very fact that—as a mortal—Orpheus managed to go down to Hades and return put him in a very special class of mythical figures that were worthy of veneration. 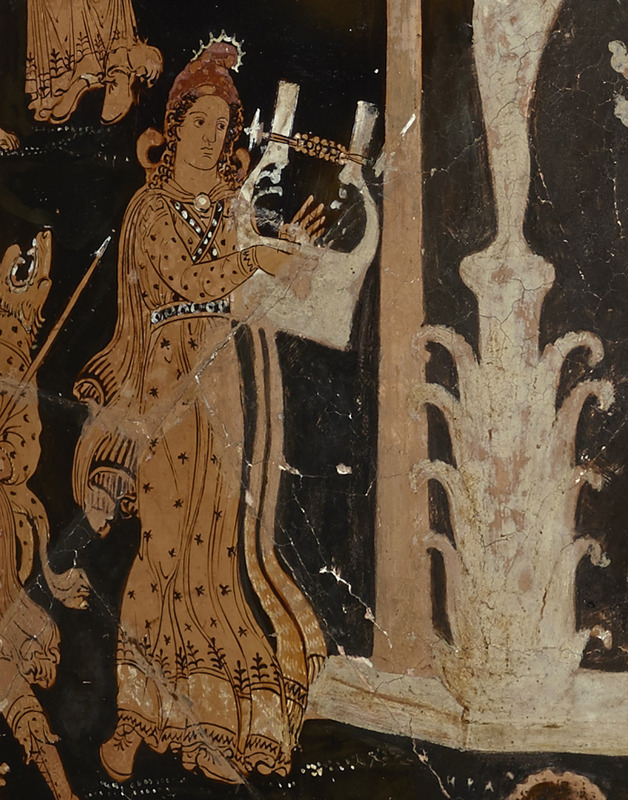 He appears regularly in Underworld scenes on South Italian vases, offering the hope that death may not be the end. 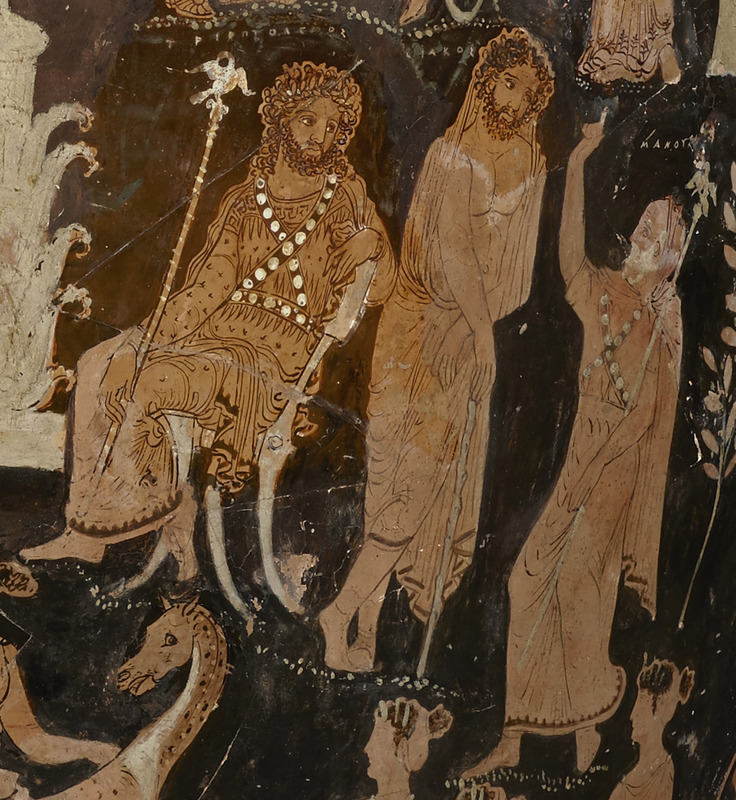 One of the few other characters who managed to go down to Hades and return was Herakles, and he’s visible at bottom center, grappling with the triple-headed Kerberos. This terrifying subterranean guard dog was fairly docile before those arriving into Hades, but turned savage should anyone try to leave. All the more credit to Herakles, therefore, for being able to bring the beast up to the mortal realm as one of his labors. Here, one of the dog’s snaky tails nips at the hero’s shin. Speaking of labors, this vase demonstrates rather well that, in the ancient Greek mindset, great suffering need not only be raging pain or cat-o’-nine-tails torture. It could also be the performance of tasks that were futile, endless, and soul-destroying. So, in the bottom left corner, Sisyphus pushes his rock up a hill again and again and again and again. 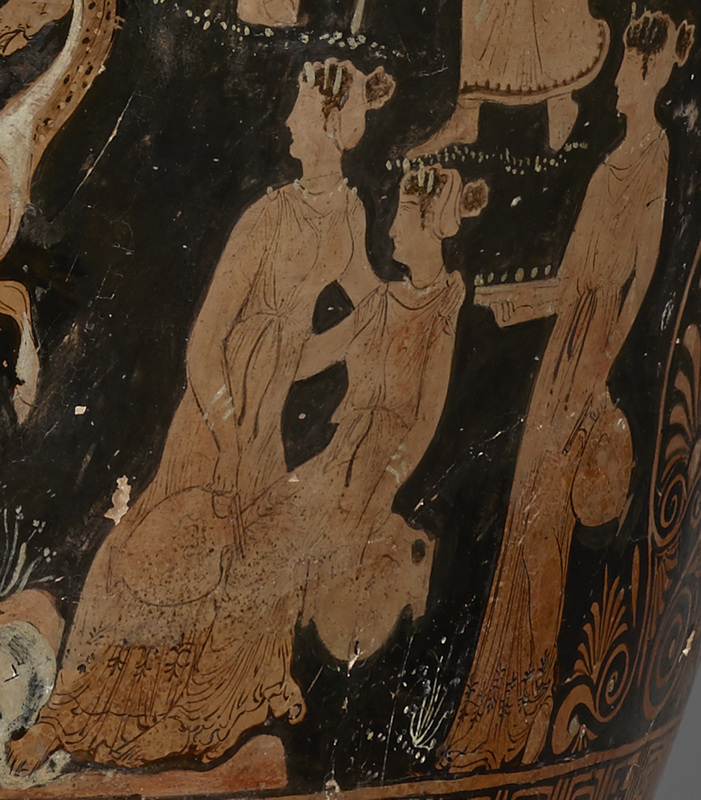 And at the bottom right, three young girls with water jars are the Danaids, destined to pour water forever into a leaky vessel as punishment for murdering their husbands. Administering and overseeing this endless schedule of wearying torture are the Furies. 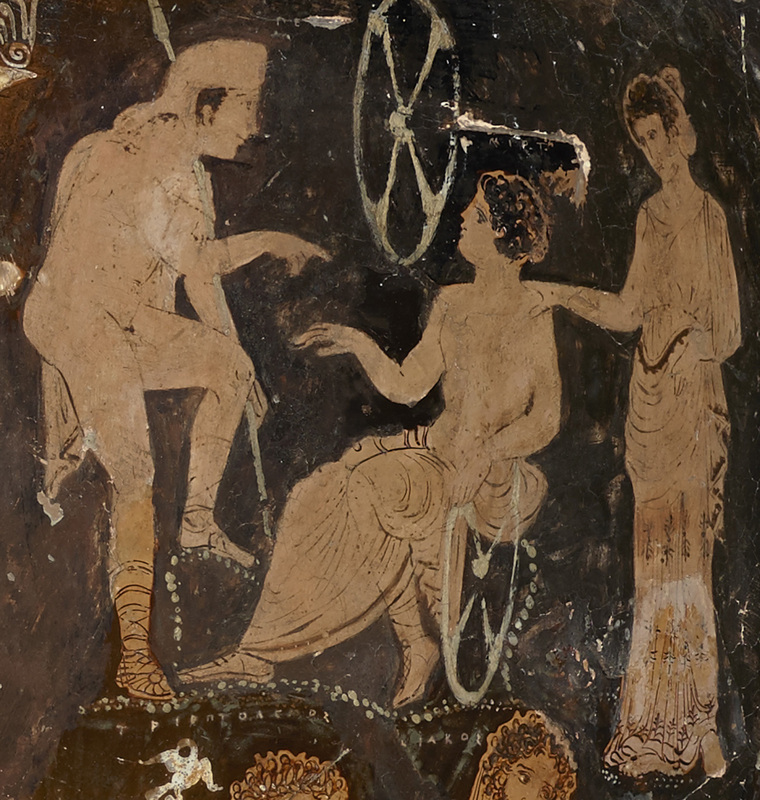 One, with whip in hand, keeps a close watch on Sisyphus, as her sisters wait at their ease. In surveying this complex and detailed scene, we can see that some figures are destined to reside in the Underworld forever, while (a very few) others can come and go. One mythical being who spans the different realms is Hermes, the messenger god. 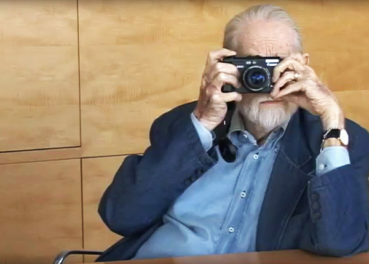 One of his most important functions was as psychopompos, a guide to the souls. Here he appears to have been distracted from Sisyphus’s toils by Herakles’s struggle with Kerberos. How to judge the combined effect of these different figures and their stories? To a greater or lesser extent, one might expect to see any of the characters described thus far in the Underworld. But what about Megara with her children at the top left of the scene? Their deaths came about through one of the most bizarre and savage stories in Greek myth. 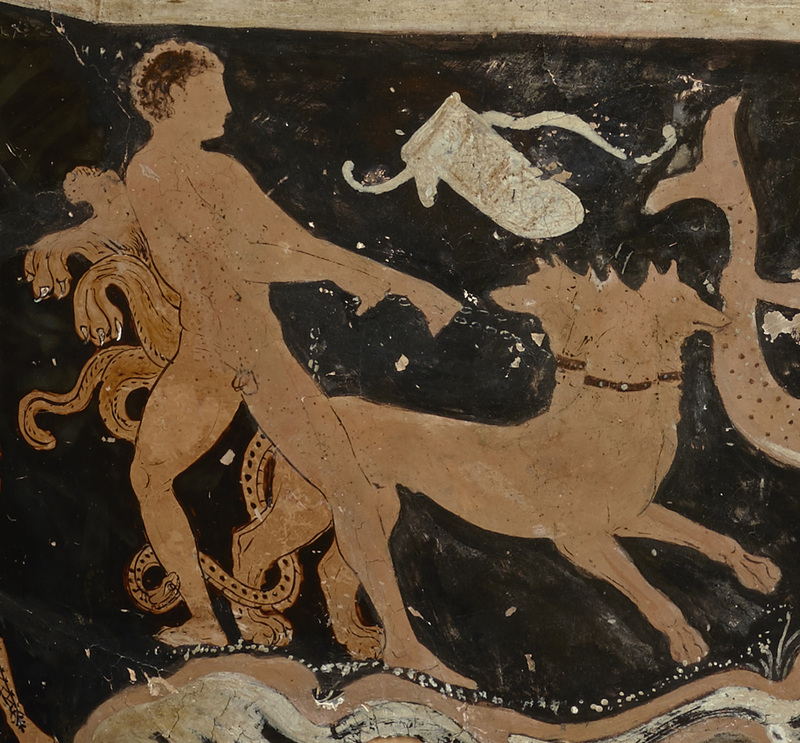 As vividly recounted in Euripides’s play Herakles Furens, Herakles rescued his family in the nick of time from a local tyrant, but then—through the scheming of the goddess Hera—the hero fell into a mad frenzy and slaughtered his wife and sons. What relevance did this harrowing tale have to those viewing the vase? Or, scanning across to the other side of the palace, what are Pelops, Myrtilos, and Hippodamaia doing here? They’re best known for the story set at Olympia, when Pelops won Hippodamaia in marriage by bribing her father’s charioteer and winning a chariot race. Why should they be in Hades? (I have a sneaking suspicion that a restorer’s hand might be involved, but will save that until we’ve studied the vase more fully.) And what about the woman on a fishy horse? There is so much to explore on this vase (I’ve not even turned to the other side yet), and this brief introduction only scratches the surface. 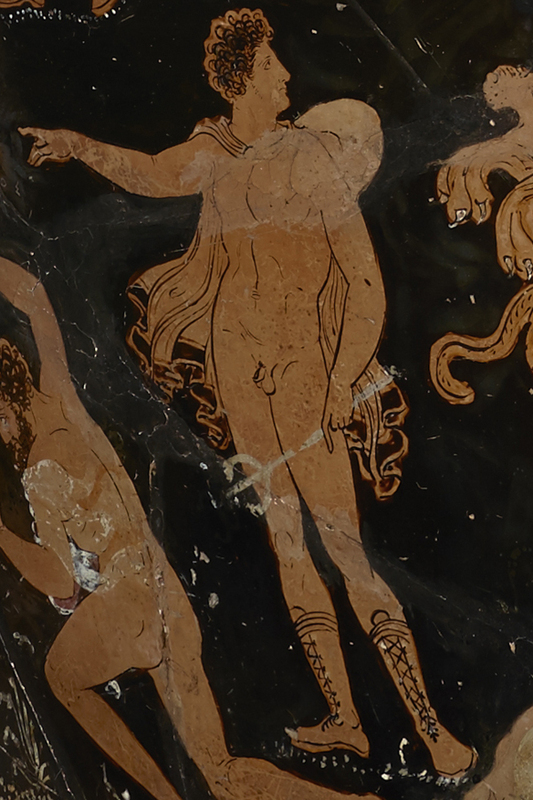 The krater will be undergoing conservation treatment here at the Villa for the next two years, and—now that we don’t have to make any libations or sacrifices—I look forward to exploring the Underworld with you here on The Iris in more detail. Are there any scholarly books or? that go into detail concerning this particular vase. I have searched on JSTOR and there is very little there. 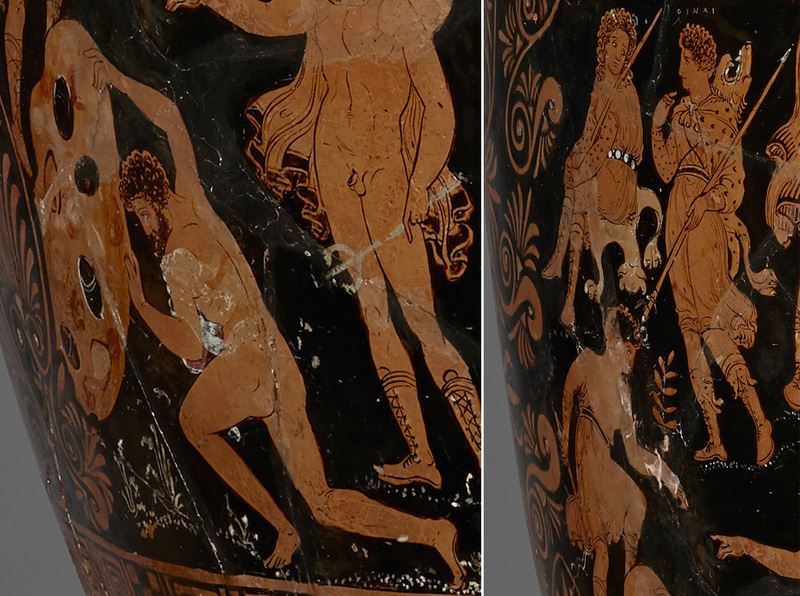 I am interested in finding details about each of the figures on the vase, front and back. Wow! This is a wonderful vase! I teach mythology and I will post a link to the blog in my course management site. The close-ups are helpful. Thank you. This is an awesome piece with lot of images to inspire our imaginations about ancient Greek ideas about the afterworld. 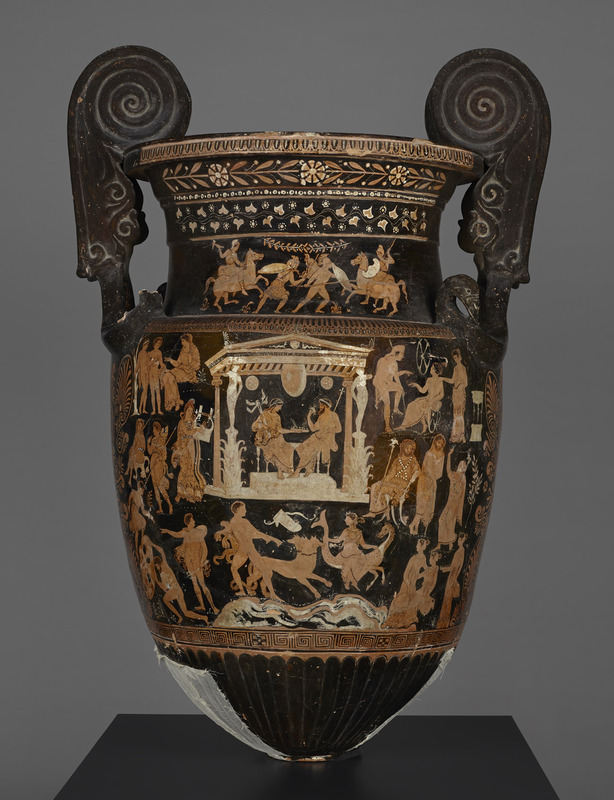 David, I just viewed the Altamura Vase at Getty Villa’s Underworld: Imagining the Afterlife exhibition. It is exceptionally curated. The visual myths on this vase are stunning. You curated the exhibition so beautifully. The Relief with figures Hermes, Euridike and Orpheus is one of my favorites. Thank you – I am touring these pieces today with a group.